Kabul: Afghan President Mohammad Ashraf Ghani has said the Afghan National Defense and Security Forces would not accept transient peace. He made the remarks during a ceremony which was organized in ARG Palace to confer medals on some Afghan soldiers who had participated in an operation that resulted into the release of 38 people from a Taliban prison. According to President Ghani, the Afghan security forces are moving towards self-sufficiency and would not accept a transient peace until a single a drop of blood remains in their body, emphasizing that a peace deal which does not guarantee the role of security forces would not be able be acceptable. “Those who are forcefully bringing others to negotiate must not talk about dissolving our “lions” (army); if they are so brave, then they must come and fight on the battlefield instead of carrying out suicide (attacks) and explosions,” Ghani said. He assured that peace would based on a deal which should clearly outline the role of the national defense and security forces. President Ghani also emphasized that the Afghan forces are prepared for generations, not for a day, for a year, a decade or one generation. He said the security forces have the responsibility to fight until a peace deal is reached and there would be no delay in this regard. Ghani had been referring to a video issued by a senior Taliban member, and former head of the Qatar office, Sher Mohammad Abbas Stanikzai. Stanikzai had been discussing the Doha talks between the Taliban and the United States. In the video, Stanikzai said once the US forces have withdrawn from Afghanistan, there would be no need for an army in Afghanistan. 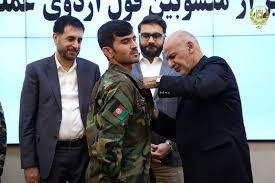 In response, Ghani said at an event to honor commandos, after they were freed last week from a Taliban prison, that the country’s security forces are improving and getting stronger and will eventually be able to work without foreign assistance. He said however they would never accept a peace agreement that’s not sustainable. “A peace that our security and defense forces do not guarantee is not acceptable to us,” Ghani added. “Our security and defense forces are not one-day forces, one year and one decade and a generation, but forces that fight for hundreds of generations,” Ghani added.